We are constantly in motion, but there are moments when we’re more aware of ourselves as in transition. Travel, illness, and heartbreak are all journeys we hope will leave us fairly intact as we traverse them. There are also those times when we’ve lost our sense of the shape of our lives: the period when something has ended and whatever comes next has not made itself clear. As we write this post, wildfires in the Northwest are consuming thousands of acres of forest, and the sky is thick with ash and smoke, while a major hurricane has claimed 71 lives and another is in progress. Meanwhile, the political climate in the US is like a pressure keg that has already begun to blow. These are dangerous times on many levels, and it can be hard to imagine what safe passage through these ecological and political disasters will look like. One thing we do know is that moving toward what we fear is often the only way through. The key word in this spell is “passage”—we must make this journey. We are the only ones who can do this. Loving each other as we do means offering each other what protection we can in these times—which can mean showing up to deflect the violence that might otherwise fall on just a few, or forgiving our friends for minor differences so we can all feel the resilience of our social worlds, or any number of acts that will help strengthen our hearts and our vision for a better world that can rise from the ashes of these fires. These transitions call for a special kind of protection, a magic that both holds the shape you cannot hold for yourself and allows you to shapeshift. Safe passage is a spell for letting yourself be transformed by your experiences, without that transformation wrecking you. Working with this spell, you acknowledge that you are on a journey and you can’t know the ways it will change you. Working with this spell, you call on the love and inspiration and support of all the beings, living and dead, who love you beyond reason. After every journey, there is a homecoming—even if it’s to a new home. Let this spell carry you toward this safe arrival, especially if you’re having a hard time trusting it will happen. For those who are currently experiencing loss or grief, this spell may help you channel your deep emotions into the larger currents of change that bring us into this life and over life’s threshold into death. The chaos we feel when our lives are disorganized by grief is indicative of the degree of connection we feel to all that we love—whether they are still “here” with us or not. Sometimes we get stuck, waiting for the reality of our love to reconcile itself with the reality of the physical world. Use this spell to help carry you over the parts of living that make no sense. Use this spell to surrender to whatever unknowable forces keep moving us inexorably forward. For this meditation, claim some time in which you can settle, to the best of your ability, into some kind of comfort. Notice if your default is to decide that you are comfortable before really discovering what comfort means to you in this moment. Notice the position your body takes—let it move or be still as it pleases. With your eyes open, let your gaze land gently on the outside world and allow for the receptivity of your vision by drawing whatever beauty you see in. Draw in the stability of solid things and draw in the nourishing mystery of the invisible world that connects us all. With your eyes closed, sink into the tonic of your own private darkness and allow its depth and richness to restore you where you are depleted, to settle you where you tense. Allow your breath to be like water, moving in waves, saturating your blood with life, and rinsing your cells clean. In a soft and gentle voice, ask yourself—where in my body do I fear change? Give your body the time it needs to speak. It may speak in sensation, so listen for tension, temperature, texture. You may see visions, colors, and memories. You may feel into stories, myths, and dreams. Whatever you find, go to it. Gather your courage and ride the waves of your breath to surround this energy, sweetly and with loving curiosity. Hold yourself here, needing nothing but this togetherness. Perhaps you let your body rock gently, side to side. You may feel moved to speak to this fear, saying “I see you. I hear you. You are welcome here with me. We are in this together.” Follow your instinct in this tender connection, speak or do whatever you need to to honor the wholeness you form with yourself when you move toward rather than away from what is unsettling you. Bravery relies on fear; without fear, there would be no cause for courage. Let your attention come back to the comfort you cultivated at the beginning of your meditation. Consider all the others who are working to heal themselves and this world we share. Remember, they are also afraid, also struggling to discern the best way forward. By cultivating a relationship with your fear, you are growing the courage needed to stay on course as you pump your wings through these stormy winds of change. May we find each other out there in the storm and form together into another kind of wholeness—this is resilience. This resilience is our birthright. Corina: One of our three crow altars, this image resonates most with me. I’m a frequent traveler, and have been through a fair number of other transitions in the last few years. I knew I wanted to create a landscape on the tabletop that each crow altar shares, and I like how the rocks and blue ribbon double as mountains and a river. Thyme is present as a supportive and protective herb, and to play off the idea of time and space, with the compass—reminding us that each moment is a passage through time... As always, I’m so impressed with my sister’s painting of rocks and birds. Jocelyn: Rocks and crows, rocks and crows, I will never grow tired of painting rocks and crows. I’m trying to remember what it was like to create this image, but what is coming most strongly to me in this moment is a sense of its medicine. Corina and I are currently working on next year’s calendar images. We are over a thousand miles away from each another and life is pulling our attention in to so many directions. I am inclined to use this sweet little window of words and intention to bring the medicine of safe passage to all the pieces of art we have currently forming!! Art for Sale: We've got a sale going on this image for the whole month of September! 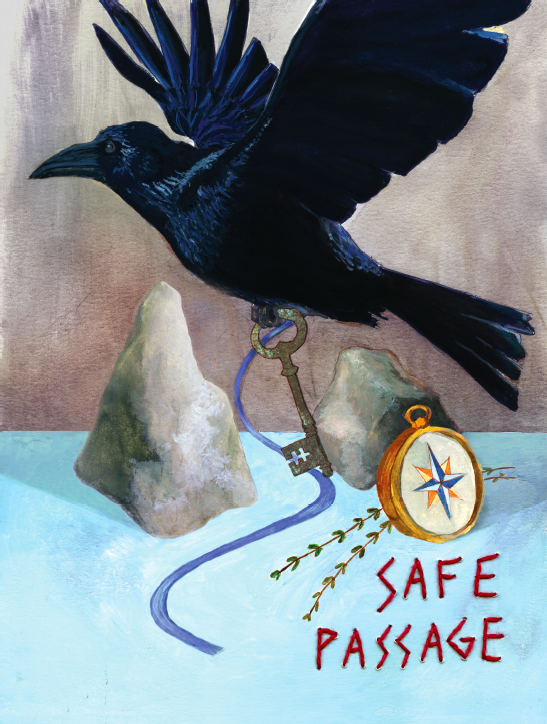 Buy a print of Safe Passage and get 15% off, using the coupon code PASSAGE. This month Corina is still accepting students for her new Astrology 101 Immersion course, which will meet through video conferencing once a week beginning on September 21st. This course distills her many years of teaching astrology, and helps students build their vocabulary and practice chart interpretation. Learn more about it! This month Jo is juggling school, internship, and art-making while facing the particularly rich struggles of becoming a therapist in a culture that cannot care for its people. If you're in Asheville and curious to learn more about local, free support groups for survivors of sexual violence starting in October, please get in touch!